Bring home your dream RV with Lakeshore RV Center! With the nation's lowest prices on quality RV brands, you'll be able to save thousands! That's just one of the reasons why we're the number one Michigan RV dealers! Visit our lot at 4500 E Apple Ave Muskegon Michigan 49442 to find the adventurous 2019 Keystone Cougar 315RLS! Call us at 231-788-2040 to learn more about this 5th Wheel or any of our other models! When you want to hit the road, this rig is ready! It has a hitch weight of 1995 lbs. and a sturdy GVWR of 12390 lbs. At the campsite, you can relax under the 13' 0" patio awning for shade and protection! There's ample space in the living area of this Keystone Cougar, with the 3 slides that protrude out. At 35' 8" long, 8' 0" wide, and 12' 6" high, you'll have no problem walking around inside! The 30000 BTU furnace and 15000 BTU a/c allows you to decide how warm or cool your trailer will be, despite the weather outside! After a full day of outdoor fun, what's better than a great night's sleep? Of course, that's difficult in makeshift beds or in a sleeping bag on the floor. 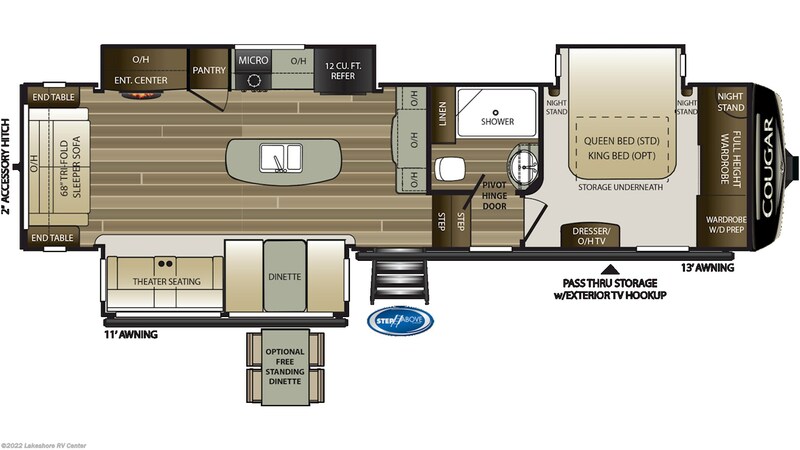 But when you camp in the Keystone Cougar 315RLS, you'll sleep in a real, comfy Queen bed in a handsomely furnished bedroom! It's just one of the many great features of this superlative RV that sleeps 6! Having appliances to cook meals and a sink to wash up is a necessity. Fill up this 2019 Cougar 315RLS and have a good deal of water to go around with your 81 gallon freshwater tank. There will be plenty for scrubbing dishes, getting a refreshing drink, and much more! Stock up your 12.00 cu. ft. refrigerator and set out on a fun RVing trip with all the foods you love! Cook up your meals using the 3 burner range cooktop to avoid the hassle of campfire cooking! andnbsp;Your family will be enticed by the dancing flames of the beautiful fireplace! Check out Stock # 28078 - 2019 Keystone Cougar 315RLS on keystonervsource.com!